According to the travel trade organisation Abta, 38% of ski and snowboarding holidaymakers in this age category may not be covered in the event of an accident. Comparatively, under a third (29%) of all age ranges do not check they have appropriate travel insurance for winter sports trips. 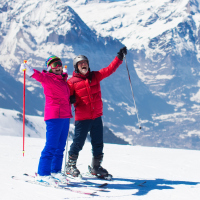 Older travellers are increasingly favouring winter sports holidays, with around 238,000 people aged 55-64 estimated to have headed out on the slopes last winter. This has doubled from the previous year, Abta has said. With around 1.75 million Britons expected to go on a skiing or snowboarding trip this winter, the travel body is issuing a warning to ensure holidaymakers don't run the risk of being landed with costly medical bills. Nikki White, Abta's director of destinations and sustainability, warns: "Many holidaymakers wrongly assume they are automatically covered for winter sports as part of their travel insurance but it is often not the case. "It is a costly business if you have an accident on the slopes and don't have the right insurance to cover your medical bills." According to the Foreign and Commonwealth Office (FCO), thousands of winter sports enthusiasts are recorded as suffering injuries on the slopes. Philippa Makepeace, The FCO's head of consular assistance, said: "We'd encourage everyone who is travelling to take just a few minutes to check that they are covered for all the activities they have planned and any medical conditions have been declared. "This small step can help ensure that you get the support you need should anything go wrong, and avoid potentially huge costs if you are not appropriately covered. Heading out on the slopes can be fun, and as you get older, its increasingly important to stay active. But it's also important to have plans in place should you sustain an injury on the slopes by taking out winter sports travel insurance.